→Which Is The Best Juicer For Carrots ? So naturally, we as the consumers are left with one nagging question: which is the best juicer for carrots? We all know by now about the multitude benefits of including carrots in your diet, and juicing your fruits and veggies has become a very popular way of adding those vitamins, minerals and enzymes to your diet, so it is no surprise that carrot juice has become very popular recently. But not all juicers are capable of handling tough vegetables like carrots, and not all of those which can handle the job are capable of delivering a satisfactory quantity of juice, or even with all of its nutrients and enzymes intact. I am going to take a look at some popular juicers, from budget models to expensive multifunctional machines, and compare what they have to offer to try and answer this question of ours. It is important to note that the masticating and centrifugal juicers will sometimes still leave a measurable amount of juice in the pulp. You can however always get yourself a manual press and use that to reclaim whatever extra liquid remains in the pulp from your juicer, getting more bang for your fresh produce buck. For this article, I will be looking at five different juicers and scoring them based on the amount of juice they produce from carrots, the vitamin and mineral content retained as far as it can be measured, how easy it is to use (including clean-up) and any extra features it might offer. Being a masticating juicer, the Omega has a slight advantage over the Breville, Champion and Hamilton beach machines, as a conclusive scientific study has found that the juice extraction capabilities of masticating juicers are generally higher than centrifugal juicers. They are vastly inferior to presses however, but considerably cheaper. More expensive models in the Omega range may very well offer greater juice yields, yet in its price range the Omega J8004 delivers enough to satisfy most juicing needs. Once again the available evidence leans in favour of masticating juicers in general. One controlled study tested for the survival rates of two specific and important enzymes found in carrots. These two enzymes were Peroxidase and Amylase. Although the presence of these two enzymes were higher in the juice from masticating juicers than centrifugal juicers, the difference in their survival rate at various intervals over a period of two days were not statistically significant. If you are concerned with the other nutrient-goodness locked up in your carrots, masticating juicers are more likely to retain proteins and fibre. The lower speed and subsequent lower froth produced by the Omega also means any nutrients present are exposed to less air and oxidises at much slower rates. When you start using the Omega J8004, you will find that it is very easy to set up. However, the small-ish feed tube means that larger carrots will have to be cut up first, before they can be fed through the juicer. If you are going to be using this juicer on a tight schedule this may be something to bear in mind, yet is a minor inconvenience that is easily negated by some planning and pre preparation. In any case, you will probably save any lost time on this machine’s easy clean-up. If you are like me and are a bit of a gadget-person, the Omega J8004 comes with a whole variety of attachments for grinding coffee, making nut butters and even attachments for making pasta. On an aesthetic level, as with most macerating juicers, the low speed ensures that what comes out is a smooth liquid that is virtually free of froth and bubbles. This machine is a little pricey (Albeit far from being one of the most expensive juicers you can buy), however this is really one of those cases where you truly get what you pay for and with its generally higher juice yields you will be spending a lot less on fresh produce in the long term. Not all juicers are suited to the tough task of taking on the mighty carrot, and when they are suited to the task, some are just plain better at it than others. Of course you know this, that is why you are reading this article, but you probably didn’t know is that the Breville Juice fountain is not only very good at taking on the harder, tougher fruits and veggies, but also softer ones, as it is a multispeed juicer with a really powerful 900-watt motor. As pointed out with the Omega, centrifugal juicers do tend to produce less juice from carrots than their masticating counterparts, yet with this particular model it is a worthwhile trade off should you be interested in juicing more than just carrots. Having said that, there have been consumer reports of wetter than expected pulp, meaning that it may not always extract juice quite as efficiently as possible, even compared to other centrifugal juicers. The nutrient retention in terms of the two tested enzymes mentioned above is slightly lower than with masticating juicers, and the high speeds and resulting froth will aerate the juice more, which does lead to a higher rate of nutrient oxidisation. A large feed chute and all components being dishwasher safe means that not only will you be spending a lot less time on cutting up larger carrots, but you can also save quite a bit of time on clean-up. If you are worried about the multi speed functionality and the high-tech looking display and interface, you can relax. It is truly a smart machine that can auto-detect the load and calculate the appropriate speed for you. Apart from the fact that it is a really good looking machine, it is also constructed from high grade stainless-steel, titanium and heavy duty plastics, which means it is built to last. It also comes with a built-in feature that is essentially an overheating safe-guard that senses when it is loaded too heavily and automatically shuts the machine off. Combine that with the extra-large pulp and juice collection containers, and you have a machine perfectly suited to make your juicing life a whole lot easier. With this blender, you are definitely not looking at one of the most expensive juicers on this list, yet for the functionality and the ease of use intrinsic to this machine, it is an easy price to pay for what you get. As the second centrifugal juicer on our list, the same principal of higher general juice yields for masticating than centrifugal juicers that was true for the Breville juicer also applies here. Compared to the other centrifugal juicer on this list, it has been reported by a consumer who has owned both, that the Hamilton beach has a greater juice yield. To be noted however, is that this may very well either be negated by the fact that some users have found some rather large pieces of fruit in the pulp container, which would ultimately detract from the overall yield you can get from your produce. With carrots though it did produce quite a dry pulp, which means juice yield per kilogram (or dollar) of carrot is good. Once again, as a centrifugal juicer, the Champion machine starts off at the same slight disadvantage that the Breville had to deal with. It does seem prone to produce quite large amounts of froth, which as stated has negative effects due to oxidisation. If I were to say that assembly of this juicer is as easy as one, two, three, you would probably think it is an easy go-to cliché, however it literally is just slotting three well-fitting parts into place. Cleaning is simple enough, and included in the price is a cleaning brush to help clean the juicing basket. It has a comparatively large pulp container that means it does not need to be emptied too often, and the cleaning brush is is a nice extra that just makes life that little bit easier. If you are just getting into juicing and just want to give it a quick try before you wholly commit your lifestyle to it, then you probably would not want to start off by spending a whole lot of money. This juicer is a real value for money item that gives competitive results. 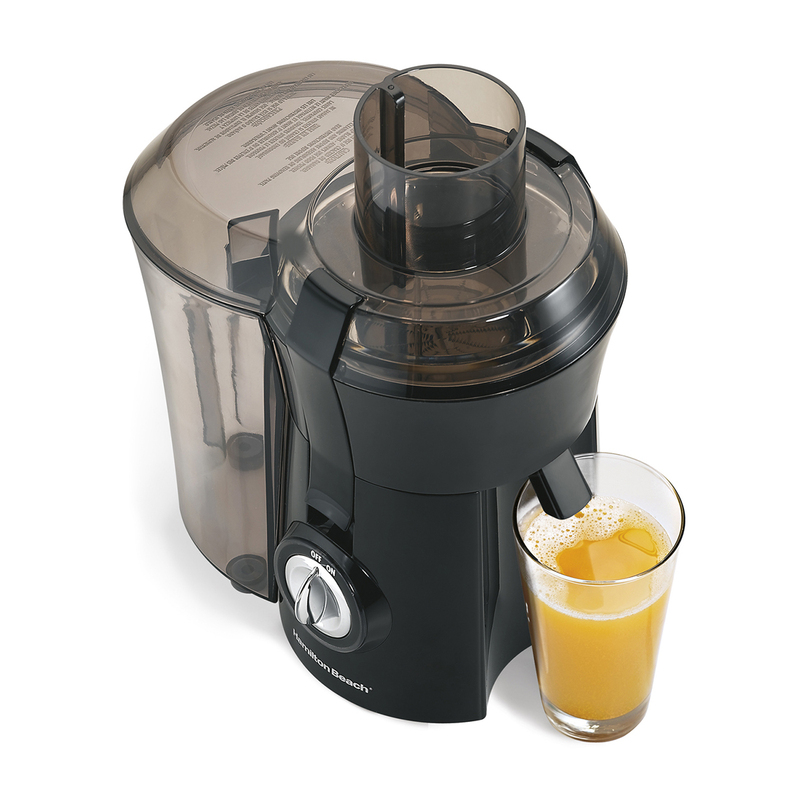 In a direct comparison to our Omega juicer, the Champion G5-PG710 did produce marginally more juice from the carrots, and even though the difference might seem minimal, if considered over a longer time span, those little bits extra can quickly start adding up to very large gains in terms of what you spend on fresh produce. It has to be noted that in a direct comparison to the Omega, it did produce more foam in the juice, which can be attributed to the fact that it works at a much higher speed. It will however have less pulp added, which means you do lack some of the benefits of the bit of fibre that the Omega added.. It does have a larger feed chute compared to the Omega, which means less prep of the produce. Some minor issues with dripping and leaking have been reported, which may add to your clean-up time. The various long term warrantees that you get on this machine does speak to the manufacturers confidence in their product. It also comes with blanks to use in place of the juicing screen, for making purees and butters. This comes at quite a sturdy price, though compared to other high-end masticating juicers it is more or less in the expected price range. In the controlled scientific study that specifically made use of carrots, the ultimate juice yields were achieved by the press juicers and were significantly more than the majority of other juicers. This is also something that you can confirm for yourself when you handle the pulp after the juice has been squeezed out. It is a solid, almost bone-dry brick that indicates almost perfect juice extraction. Nutrient retention in the same study was also higher, which can probably be attributed to the fact that the juice is squeezed out and not spun in any way, which means there is virtually no aeration and subsequent oxidisation taking place. The straining cloths or bags also retains absolutely all of the pulp, and therefore it will contain virtually no fibre. It is probably the most intricate machine on this list, requiring quite a bit of manual participation, needing collection and transfer of the pulp to the straining bags/cloths, and a bit more attention when setting it up. Cleaning is simple enough, yet the squeeze cloths do need to be cleaned thoroughly and stored properly to discourage bacterial and fungal growth. Apart from its noticeably sturdy construction, as far as extra features go, the Norwalk does not really offer much and you can make the argument that this is a good thing. The Norwalk is a single purpose, specialised machine. It is not meant to do anything other than what it was designed for: Make the largest amount of healthy juice possible. $ 2595 if you order it on their website. Yes, you read that correctly. Almost three thousand dollars. It is by far the most expensive juicer on this list, as well as the market. However I have come across some second hand models online that looked to be in fairly good condition, for around $1000. So, which is then the best juicer for carrots? Well despite the little more hassle to operate, and the colossal difference in price, I would have to say that it is the Norwalk press. Ultimately the amount of juice it yields and nutrition retention does set it apart -and that is far apart- from the rest of the competition. If it falls within your budget, or you can get a second hand one in a good condition for a reasonable price, then the Norwalk is going to end up lasting much longer, as well as delivering a lot more over its long lifespan, making up for the extra dollars spent on the initial purchase.